In Quest for Piety and Obedience, the authoritative history of the Brethren in Christ Church, Carlton Wittlinger details the significant changes or innovations that characterized the church during what he calls “the first period of transition” from 1880-1910: missions, local church outreach, Wesleyan holiness, institutions like Messiah Lifeways and Messiah College, and the founding of a church publication. One of the first names associated with the new publication, the Evangelical Visitor, was Henry Davidson, its first editor, who served in that capacity from 1887-1896. But who was Henry Davidson? That question is answered by Lucille Marr in the first article in this edition of the journal. You may remember Marr’s analysis of the call of Henry’s daughter H. Frances Davidson to mission work in the December 2017 edition. Now she turns her attention to the story of Henry and his second wife, Fannie Rice Davidson. Drawing on denominational resources, family letters and diaries, contemporary social science literature, and public records such as ancestry.com, Marr paints a fascinating portrait of Henry and Fannie and their public and private lives and ministry. Marr’s interest in the Davidson family is personal; she is Henry and Fannie’s great-great granddaughter. Some years after Henry Davidson’s death in 1903, World War 1 was raging and many men from Anabaptist-related communities in the United States and Canada were faced with the choice of whether or not to join the military campaigns their respective countries were waging in Europe. During World War 1, when there was not yet an alternative to military service for conscientious objectors to war, many young men ended up in prison for refusing to put on a military uniform and join the armed forces. Among those who went to prison were members of the Hutterite community. Duane Stoltzfus, professor of communication at Goshen College, was the Schrag lecturer at Messiah College in February 2018. in his public lecture, Stoltzfus told the story of four Hutterite men who were sentenced to hard labor and imprisoned on the infamous Alcatraz island in San Francisco. The lecture, drawn heavily from his book, Pacifists in Chains: The Persecution of the Hutterites During the Great War (John Hopkins University Press, 2013), is reprinted here. The year before the United States entered World War I in Europe, a new Brethren in Christ mission station was founded in Northern Rhodesia (now Zambia) in 1916. In previous editions of the journal (December 2016, April, 2017, and August 2017), Dwight Thomas has told the story of Sikalongo Mission, and now in this edition, he brings his comprehensive history to a close. 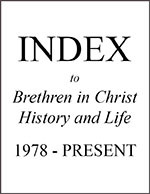 This fourth part focuses on the period from 1978, the year the first Zambian-born bishop of the Brethren in Christ Church in Zambia was consecrated, to the present, and highlights the progress of four institutions: the Sikalongo Bible Institute, the Sikalongo Hospital (or Clinic), the Sikalongo Primary School, and the Sikalongo Mission Church. Four book reviews round out this edition, covering books on topics ranging from an Anabaptist perspective of what it means to part of in the Kingdom of God now(as opposed to sometime in the future), the art of Amish quilts, American evangelicalism, and an intergenerational dialogue on issues facing the church.